Some of the world’s leading astronomers — including Great Britain’s former astronomer royal, the Cambridge physicist Lord Martin Rees — believe aliens, rather than using different radio waves or visible light to signal, may be using an entirely different communication medium such as neutrinos or gravitational waves (ripples in the fabric of space-time) or using communication mechanisms we cannot even begin to fathom. “I think it very likely – in fact, inevitable – that biological intelligence is only a transitory phenomenon… If we ever encounter extraterrestrial intelligence, I believe it is very likely to be postbiological in nature, wrote Arizona State’s Paul Davies in “The Eerie Silence”. Davies suggests that advanced technology might not even be made of matter. That it might have no fixed size or shape; have no well-defined boundaries. Is dynamical on all scales of space and time. Or, conversely, does not appear to do anything at all that we can discern. Does not consist of discrete, separate things; but rather it is a system, or a subtle higher-level correlation of things. “Are matter and information,” Davies asks, all there is? Five hundred years ago, Davies writes, “the very concept of a device manipulating information, or software, would have been incomprehensible. Might there be a still higher level, as yet outside all human experience, that organizes electrons? If so, this “third level” would never be manifest through observations made at the informational level, still less at the matter level. 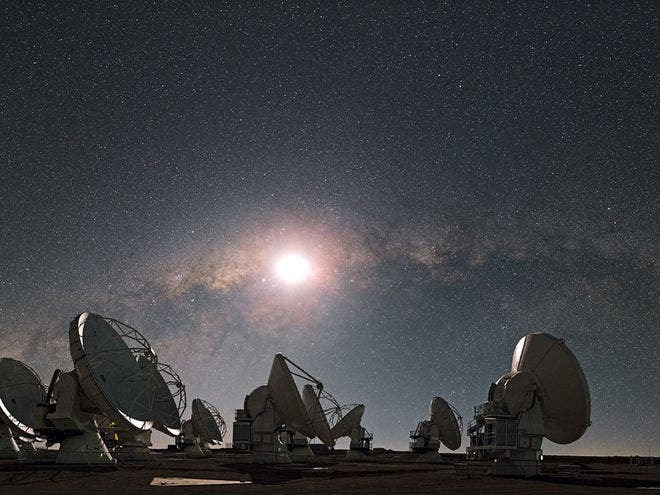 Frank Drake, the founder of SETI and Drake’s Equation, believes that satellite TV and the “digital revolution” is making humanity invisible to aliens by cutting the transmission of TV and radio signals into space. The earth is currently surrounded by a 50 light year-wide “shell” of radiation from analogue TV, radio and radar transmissions. According to Drake, digital TV signals would look like white noise to a race of observing aliens. Milan Cirkovic of the Astronomical Observatory in Belgrade, has pointed out that the median age of terrestrial planets in the Milky Way is about 1.8 gigayears (one billion years) greater than the age of the Earth and the Solar System, which means that the median age of technological civilizations should be greater than the age of human civilization by the same amount. The vastness of this interval indicates that one or more processes must suppress observability of extraterrestrial communities. Since Earth’s placement in space and time appears to be unremarkably random, proposition “A” seems fairly unlikely. Assuming humans evolved like other forms of life into our present state due to natural selection, then there’s really nothing all that mystical, special or remarkable about our development as a species either. Due to the sheer numbers, there are almost certainly other planets capable of supporting at least some form of life. If that is so, then for Earthlings to be the very first species ever to make a noticeable mark on the Universe, from a statistical perspective, is incredibly unlikely. Proposition C in some ways, appears to be more likely than A or B. If “survival of the fittest” follows similar pathways on other worlds, then our own “civilized” nature could be somewhat typical of extraterrestrial civilizations that have, or do, exist. “The Three Body Problem” by science fiction Hugo Award winner, Liu Cixin, depicted the universe as a jungle with every civilization as a hidden hunter. Those who are exposed will be eliminated. But Han Song, another leading Chinese science fiction writer, believes humans naturally want to connect, citing the Internet as proof. “I think aliens might think similarly. It is a biological instinct to connect with each other. Everyone wants to prove that they are not alone in the universe. Loneliness is intolerable to humans,” he says. Regardless of the theoretical debate, scientists have never wavered in the search. “I think we shall call out. As a matter of fact, we have been yelling for years, and our radios and televisions are broadcasting in space all the time,” says Mao Shude, director of the Center for Astrophysics of the Beijing-based Tsinghua University. “Aren’t you curious what our counterparts would look like? The image at the top of the page shows the Thirty Meter Telescope (TMT): a gigantic instrument with a mirror nearly three times as wide as any telescope in existence (another telescope, currently being built in Chile, will be larger). 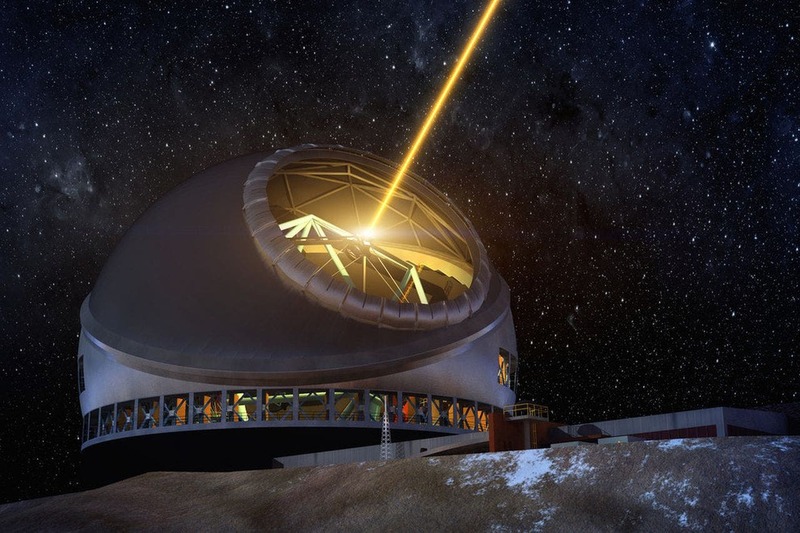 Once it’s finished in 2024 atop Hawaii’s Mauna Kea, astronomers plan to use the TMT to observe objects billions of light years away to better understand the processes that occurred just after the formation of the universe.